Tuscaloosa. — The Sarah Moody Gallery of Art is pleased to present Confluence by Jerry Uelsmann, March 21 through May 3, 2019. An opening reception will be held Thursday, March 21, 2019 in the gallery in Garland Hall. The exhibition by the acclaimed innovator of the technique of photomontage features 58 photographs from the artist’s work produced from 2014 to 2017. These black-and-white photographs are inspired by Uelsmann’s friendship with European art history scholar, Dr. Moa Petersen, who is writing his biography. Born in Detroit in 1934, Jerry Uelsmann received his BFA degree at the Rochester Institute of Technology in 1957 and his MS and MFA at Indiana University in 1960. He began teaching photography at the University of Florida in Gainesville in 1960 and became a graduate research professor of art at the university in 1974 until his retirement in 1997. He lives in Gainesville, Florida. Uelsmann received a Guggenheim Fellowship in 1967 and a National Endowment for the Arts Fellowship in 1972. He is a Fellow of the Royal Photographic Society of Great Britain, a founding member of The Society of Photographic Education and a former trustee of the Friends of Photography. 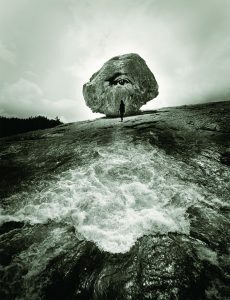 Uelsmann’s work has been exhibited in more than 100 solo shows in the United States and abroad. His photographs are in the permanent collections of many museums worldwide, including the Metropolitan Museum of Art and the Museum of Modern Art in New York, the Chicago Art Institute, the International Museum of Photography at the George Eastman House, the Victoria and Albert Museum in London, the Bibliotheque National in Paris, the National Museum of American Art in Washington, the Moderna Museet in Stockholm, the National Gallery of Canada, the National Gallery of Australia, the Museum of Fine Arts in Boston, the National Galleries of Scotland, the Center for Creative Photography at the University of Arizona, the Tokyo Metropolitan Museum of Photography and the National Museum of Modern Art in Kyoto. Image credit: Jerry Uelsmann, The Somnambulist’s Dream, 2014, gelatin silver print, 30 x 24 inches.